Using custom QML types to create different screens for different stages of the game. Using the Item and Image types to construct a game background. Using the SequentialAnimation, NumberAnimation, ParticleSystem, Emitter, and Wander types to animate background objects. Using the Timer and Repeater types to display a countdown sequence before starting the game. Using a custom QML type with custom properties to construct a game board. Using the SpriteSequence and Sprite types to add animated objects to the game board. Using a custom QML type that uses the Image type with some custom properties to add a menu where the players can buy objects. Using custom properties with private functions to keep track of game statistics and a custom QML type to display them to the players. Using the SoundEffect type to play individual sound effects depending on the object type and the action applied to the object. Using signal handlers to specify keyboard shortcuts for some game actions. Using resource files to package game resources for deployment and delivery. We use the screen types at different stages of the game. 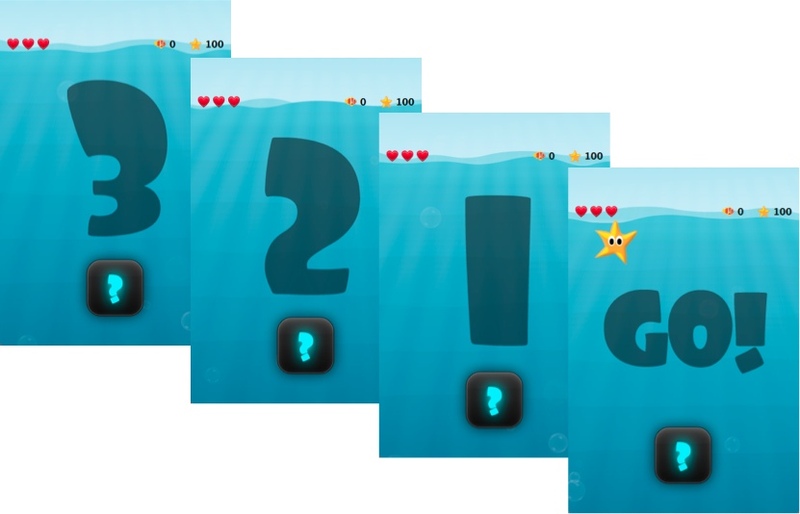 The NewGameScreen type is used to create the screen that appears when the players start the app. In NewGameScreen.qml, we use an Image type to create a New Game button that the players can press to start a new game. Tapping the button initiates a countdown timer that triggers the creation of the game canvas by using the GameCanvas type. 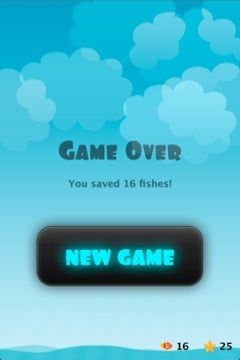 Another Timer type spawns mobs of fish inside bubbles that the players must free before they reach the surface. 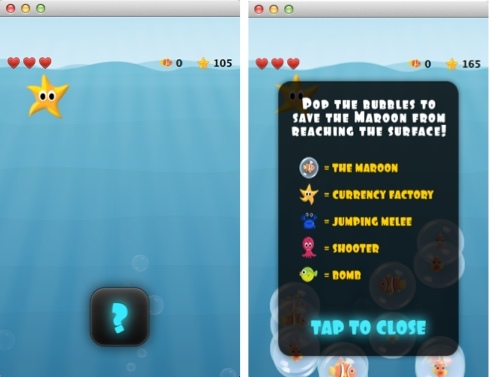 The players can tap on the screen to open a menu where they can buy different types of weapons (melee, ranged, and bombs) to burst the bubbles. When the game finishes, a screen created by using the GameOverScreen type appears. On this screen, the players can see their score and start a new game. The screens are all created on the same background and use some of the same images and animations. We declare two custom properties for the root item, gameState and passedSplash that we will use later to manage game states. We want to be able to load the background image only once at app startup and still use different scenes for the game screens. Therefore, background.png is three times the length of the root item and displays a scene that stretches from the bottom of sea to the sky above the horizon. We set a negative value for the y property to set the first scene at the bottom of the sea. We calculate the position by subtracting the height of a screen from the height property. The second row of waves is positioned on the y axis with a slight offset to the first row. We also use the opacity property to make the waves appear lighter in color than the first two waves, which gives the background some depth. We set the opacity property of the images to 0.02 and 0.04 to give some depth to the rays of sunshine. We use the y property to position the images at fixed locations on the y axis and the anchors.horizontalCenter property to center them horizontally in relation to their parent. We set the opacity property of the image to 0.5 to make the background visible behind the shadow. To make the background more interesting, we animate some of the objects we added to it. We use NumberAnimation to move the waves horizontally across the screen in opposite directions and SequentialAnimation with NumberAnimation to move them up and down. We use the easing curve of the type Easing.InOutQuad for a quintic (t^5) function to accelerate the motion until halfway and then decelerate it. We use one number animation to rotate the image from -10 degrees to 10 degrees over 8 seconds and another to subsequently rotate it from 10 degrees to -10 degrees over the same duration. We use the easing curve of the type Easing.InOutSine for a sinusoidal (sin(t)) function to accelerate the motion until halfway and then decelerate it. For examples of using SequentialAnimation and NumberAnimation on the x and y properties and the width and height properties, see NewGameScreen.qml. In addition to animation, we use particles to generate motion on the game screens. 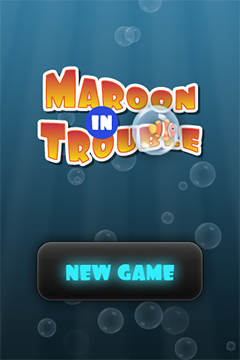 We use the ParticleSystem QML type in maroon.qml to make bubbles appear at the bottom of the new game screen and game canvas and slowly float towards the top on varying trajectories. The acceleration property uses the PointDirection type to specify random variation of the x and y coordinates, so that the bubbles appear inside a rectangular area around the emitter that is anchored to the bottom of the image. The size property sets the base size of the particles at the beginning of their life to 24 pixels and the sizeVariation property randomly increases or decreases the particle size by up to 16 pixels, so that we get bubbles in different sizes. A Wander type applies a random trajectory to the particles, so that the bubbles follow random routes from the bottom to the top. For another example of using the ParticleSystem type, see the GameOverScreen.qml file, where an ImageParticle type is used to make clouds move across the sky. In maroon.qml, we use the Timer type with a Repeater type to display a countdown sequence before using another timer to start a new game. Both timers are started simultaneously in the "gameOn" state, that is when the players tap the New Game button and passedSplash is true. This is explained in more detail in Managing Game States. The onTriggered signal handler is called when the timer is triggered to increment the value of the countdown custom property. We set the repeat property to true to specify that the timer is triggered at the interval of 1 second as long as the value of countdown is less than 5. We scale the images from 0.0 to 1.0 and use the visible property to hide the images for the previous steps as the countdown progresses. We also raise the opacity of the image that matches the current countdown step, keeping the others nearly transparent. By animating the changes in the opacity and scale properties using a Behavior type, we achieve a countdown sequence where numbers zoom in towards the players. To construct the game board, we use the GameCanvas custom type that is defined in GameCanvas.qml. We set the focus property to true to give canvas active focus on startup. We declare the goAway() private function to disable the mouse area and make the image fully transparent and a comeBack() function to enable the mouse area and make the button fully opaque. We use a Behavior type on the opacity property to apply the default number animation when the value of opacity changes. When the players tap the help button, the onClicked signal handler is called to hide the help button by setting the helpButton.visible property to false and to show the help image by setting the helpImage.visible property to false. We use anchoring to position the help button at the bottom center of the game canvas. To hide the help image when the players tap it, the onClicked signal handler within the MouseArea type is called to set the helpImage.visible property to true. To ensure that the images are placed on top when they are visible, we set a high value for their z property. The following sections describe how to use timers to add animated objects to the game board and how to create a menu dialog from which the players can add more objects to it. We use sprite animation to animate objects on the game board. The Qt Quick sprite engine is a stochastic state machine combined with the ability to chop up images containing multiple frames of an animation. We use the frameWidth, frameHeight, and frameX properties to determine that the first 64x64-pixel square of the image is framed in the "left" sprite, the second in the "front" sprite, and the third in the "right" sprite. For each sprite, the frameCount property is set to 1 to specify that the sprite contains one frame. We use the frameDuration and frameDurationVariation properties to specify that the duration of an animation can vary from 400 to 1200 milliseconds. The to property specifies that the sprites have weighted transitions to other sprites. The "left" and "right" sprites always transfer to the "front" sprite. When the "front" animation finishes, the sprite engine chooses "left" or "right" randomly, but at roughly equal proportions, because they both have the weight 1.
property bool goingLeft: fishSprite.currentSprite == "right"
We set the to property to "burst" with the weight 0 to make the second sprite, "burst", a valid goal for the jumpTo method that we use in the die() private function to jump directly to the "burst" sprite without playing the first sprite. In the "burst" sprite, we set the frameCount property to 3 and the frameX property to 64 to specify that the animation starts at pixel location 64 and loads each frame for the duration of 200 milliseconds. 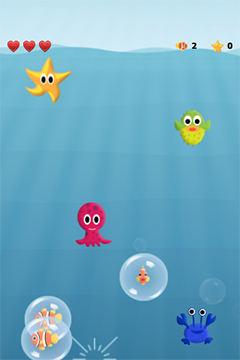 We use yet another SpriteSequence to display the effect of squid ink on the bubbles. For more examples of using sprite sequences, see the QML files in the towers directory. We set the visible property to false to hide the menu by default. The z property is set to 1500 to ensure that the menu is displayed in front of all other items when it is visible. We set the anchors.fill property to parent to allow the players to tap anywhere on the game canvas. We use a condition in the onClicked signal handler to call the finish() function if the menu is visible and the open() function otherwise. We use the towerIdx() function to set the value of the towerExists custom property. We set the shown custom property to true to show the menu and call the helpButton.goAway() function to hide the help button when the menu opens. To set the visibility of the menu to "visible" without animating the property change, we use a PropertyAction type. We do want to animate the changes in opacity and scale, though, so we use number animation to animate the value of the scale property from 0.9 to 1 and the value of opacity property from 0.7 to 1, over 500 milliseconds. We use the Easing.outElastic easing type for an elastic (exponentially decaying sine wave) function easing curve that decelerates from zero velocity. For each build button, we set the values of towerType and index custom properties that we define in BuildButton.qml. We use the canBuild custom property to prevent players from adding tower objects in locations where tower objects already exist. We use the source property to display the image for the tower type. The onClicked signal handler is called to execute the finish() function that closes the menu when the players tap an enabled build button. We use the opacity property to make the buttons appear enabled. If canBuild is true and the value of the gameCanvas.coins property is larger than or equal to the cost of a tower object, the images are fully opaque, otherwise their opacity is set to 0.4. To display a pointer on the screen at the position where the tower object will be added, we use the Image type. We use the visible property to determine whether the dialog-pointer.png image should be positioned below or above the menu. When the value of the col property equals the index and the value or the row property is not 0, we anchor the image to the bottom of its parent, BuildButton. We use the anchors.bottom and anchors.bottomMargin properties to position the info bar at 6 points from the top of the game canvas. We bind the width property of the info bar to that of its parent. In InfoBar.qml, we use an Item type to create the info bar. 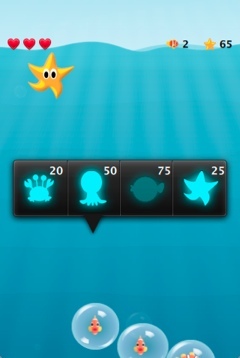 Within it, we use a Row layout type to display the number of lives the players have left, the number of fish that have been saved, and the amount of coins that are available for use. We use a Repeater type with a model and a delegate to display as many hearts as the players have lives left. We use the spacing property to leave 5 pixels between the displayed icons. In these objects, we set spacing to 5 pixels to separate the icons from the numbers that we display by using a Text type. We also switch to the "gameOn" state and move to the y position -(height - 960) to display the game canvas. The game continues until gameState.gameOver is set to true and gameState.gameRunning is set to false by calling the endGame() function when the value of the gameState.lives property becomes less than or equal to 0. For more examples of playing sound effects, see the QML files in the towers directory and MobBase.qml.